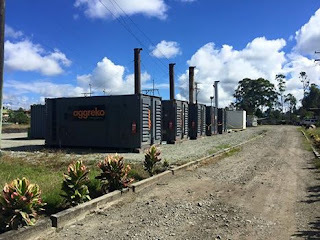 The City of Mt Hagen will see a reduction in the power outage time as PNG Power has commissioned a new 4Megawatt (MW) diesel generator at Dobel Sub Station in Mt Hagen yesterday. The 4Mw diesel generator will be generating whenever there is a shortfall in generation capacity from the Ramu Hydro Power Station in Eastern Highlands Province and Pauanda Hydro Power Station in the Western Highlands Province, or if there are problems on the transmission lines. The PPL teams and contractors will continue with more tests this weekend which may cause power interruptions so we advise our customers to be patient over this period. These tests are important to ensure future outages are minimized. Another 6Mw Generation will also be added next month to increase the take diesel generation capacity to 10Mw which should meet Mt Hagen and Jiwaka ‘s load. I take this opportunity to appeal to our valued customers in Mt Hagen who have outstanding bills to pay up as running the diesel generators would be costly.